Have you ever had a thought about 'how you will manage reading online magazines, newspapers and other big articles while you are utmost busy?' 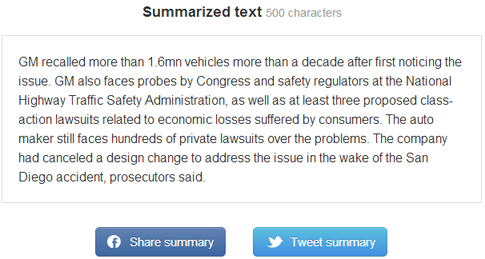 Summarizer.info site will create a concise short article for your easily, whenever you want. 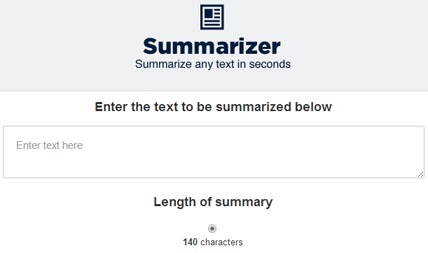 Summarizer converts long length articles into a short paragraph which are easy to go through and understand quickly. If you do not have enough time to read a long news, articles or reports, just paste the article in the field provided, decide the length of the output shortened article and get the concise report. As short as 140 characters (suitable for tweets) can be generated through this utility. If you are among the lazy readers who often skip good articles just because they are too lengthy, this post is for you! Paste the article for shortening. Select for available sizes and Click "Summarize now!" Learn the habit of reading fast and concisely with above techniques and get more and more knowledge in minimum time.